Teen clothing retailer Wet Seal abruptly closed 338 stores Monday and Tuesday, laying off about 3,700 employees on short notice. In Minnesota, stores in Rosedale, Southdale, Maplewood Mall, Burnsville Center, Crossroads Center in St. Cloud, Miller Hill Mall in Duluth and Apache Mall in Rochester closed Tuesday, according to store reps in the Rosedale and St. Cloud stores. Mall of America and Shoppes at Arbor Lakes stores in Maple Grove will remain open. The California-based company will have 173 stores in 42 states and an online business after the closings, according to a corporate statement on its website. 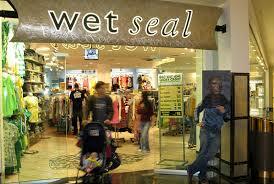 Wet Seal CEO Ed Thomas said in a statement online, "This was a very difficult decision to make, but after reviewing many other options since I returned to the Company in September, our financial condition leaves us no other alternative than to close these stores. This is an extremely difficult time for the entire Wet Seal team, and we are doing everything we can to protect the interests of all of our stakeholders, including our employees. We acknowledge and sympathize with how hard these recent events have been on our employees, both those staying with the Company and especially those who are leaving the Company this week." Teen clothing retailers in general have struggled the past few years, especially Abercrombie & Fitch, American Eagle and Delia's, which filed for bankruptcy protection last year. Others such as H&M, Forever 21 and Zara have performed better with inexpensive fast fashion. "It's a zero sum game for teen apparel retailers," said Dave Brennan, co-director of the University of St. Thomas Institute for Retailing Excellence. "Teens have limited resources and lately they're spending more of their money on gadgets than clothes."